A new month, a new challenge at 123 Challenge! I love bright yellow and used it as the background for this summer page. I did some paper folding, accordian style. The word appreciate is in my journaling..
Journaling reads, "I love this photo from years ago of my dad and my Gramma on a boat in St Lawrence River..a day full of family, friends, fun and sun, and no worries. Years have passed, and now Dad and Gramma are gone. I so appreciate the fact that I have such great memories, and that this one was captured on film!" Lovely summer page. Good luck with the challenge. 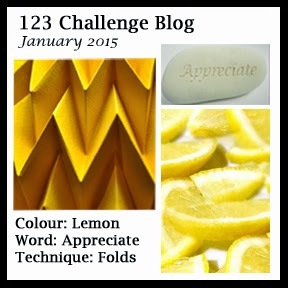 Thanks for joining in with us over at 123 Challenge Blog.